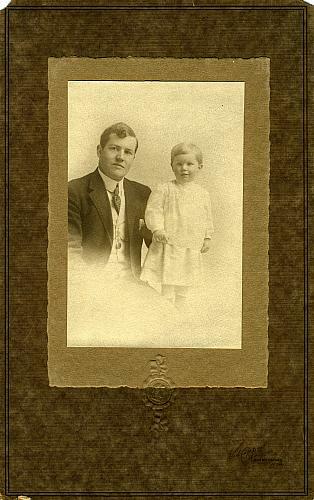 Rudolph M. Bremer, youngest child of Francis and Mary (Wurzler) Bremer, with his son, Robert Harris Bremer. Rudolph wears a light vest, striped tie, and jacket with a watch and chain visible. Robert wears a dress typical of the time for young boys. Both Francis and Mary came to Grand Rapids from Prussia (Germany), but all of their twelve children were born in Michigan. Photograph backing has embossed head of a woman and VanCampen, Grand Rapids, Mich.
At the time the studio was located at 129 Monroe.